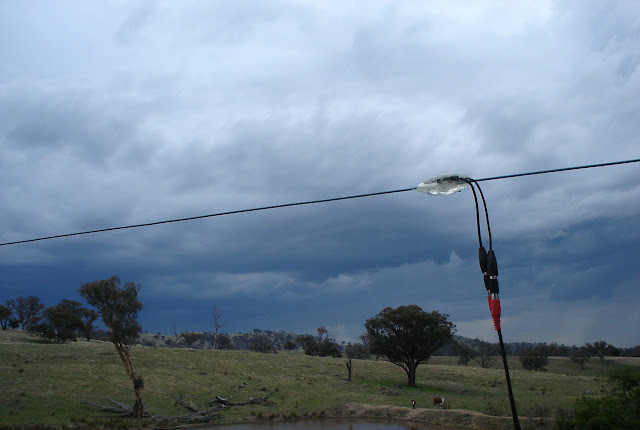 A test recording of rainfall on the Rainwire Prototype : 18th June 2015 at The Wired Lab, NSW, Australia. This recording was made using an Olympus LS-100 field recorder using the 2 piezo pickups mounted on the wire. A selection of pictures from this recording session. The altitude is about 650 metres above sea level, so there are some very spectacular views of changing rain cloud formations. Assorted pictures of the first set of piezo contact mics I've custom built for the Rainwire Prototype in January 2015. The green piezoelectric bimorph element converts mechanical vibration into an electrical signal (RS Part Number 285-784). A test recording of Aeolian Tones on the Rainwire Prototype : 16th Sept 2015 at The Wired Lab, NSW, Australia. This recording was made using the new Tascam DR-70D multi track field recorder using the 2 piezo pickups mounted on the wire. 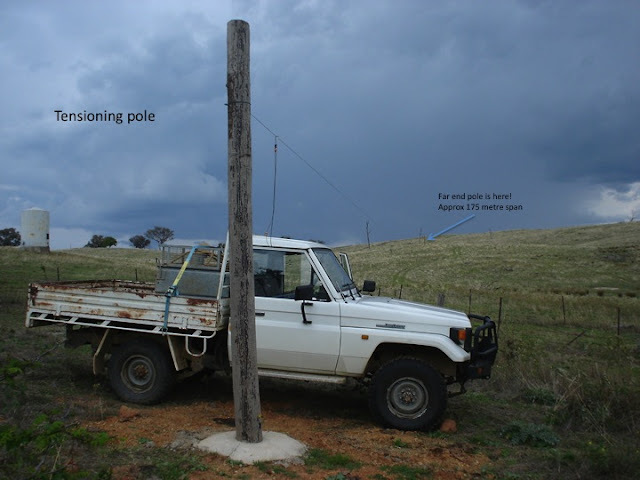 Some assorted pictures of the Rainwire Prototype construction back in November 2014 by David Burraston and local fencing contractor John Fitzgerald. This stage of construction was after the reclaimed electricity poles had been sawn to height and sunk into concrete in their chosen locations. The pictures show the construction and tensioning of the fencing wire that forms Rainwire Prototype's 180 metre span. 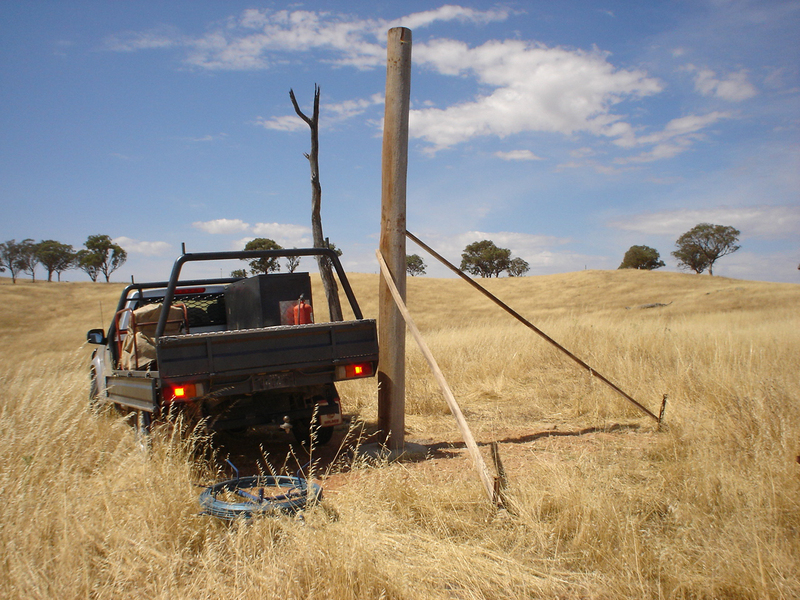 The wire span is tensioned by a fence strainer at the Woolshed pole and out on a hill in the paddock is the 'fixed end'. For an introduction to the Rainwire Project and to hear sound recordings please visit this page. A mix of long form Rainwire Prototype recordings made on 16th July 2015 at The Wired Lab, NSW, Australia, specially compiled for World Listening Day 2015. 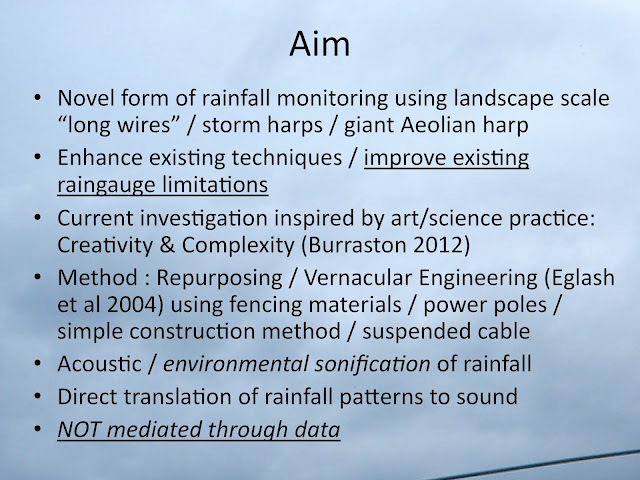 Rainwire is beyond simple sonification of data, it embeds technology & data collection within cultural contexts. With rainfall as catalyst to draw inspiration from, artists, scientists & cultural groups are key to informing science & incite new creative modalities. At the culmination of the project it is envisaged the prototype technology will be ready for adaptation to a range of contexts such as developing nations, water management, agriculture & weather/ecosystem monitoring industries. 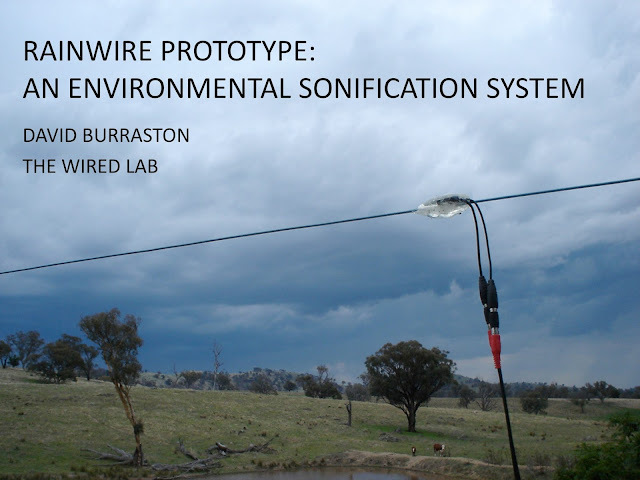 Previous work on Rainwire was conducted on shared instruments at The Wired Lab. This site will provide details, reports and reflections on the newly built dedicated Rainwire prototype, and include audio examples / images. 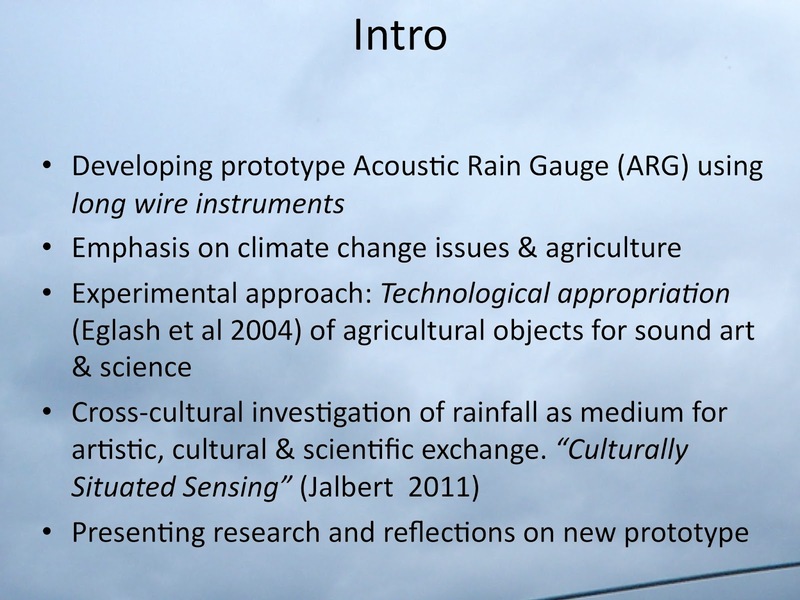 Burraston, D. (2012) Environmental Sonification of Rainfall with Long Wire Instruments. Leonardo Music Journal 22 (Acoustics) pp 11-14, MIT Press. 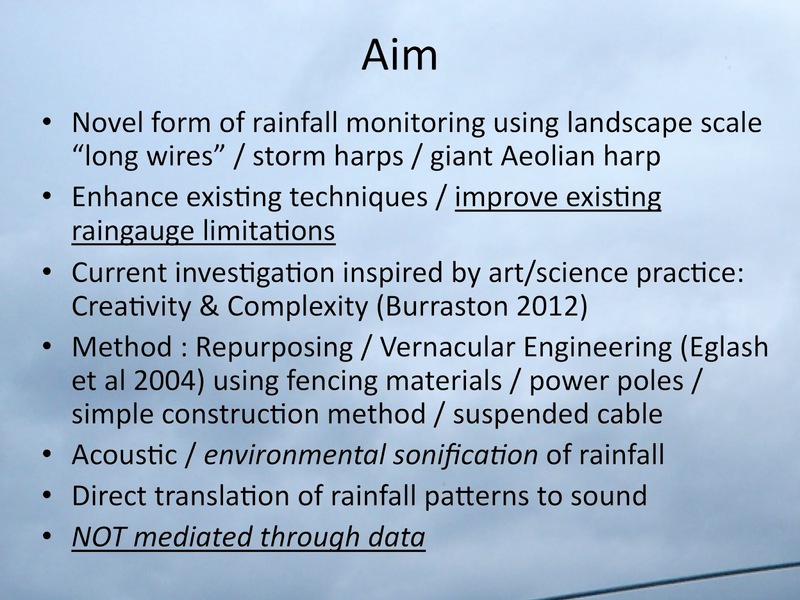 Burraston, D. (2012) Rainwire: Environmental Soniﬁcation of Rainfall, Leonardo Vol 45 (3), MIT Press.